This option may be purchased at time of build or when in for inspection service. OUTRIGGER NEEDLE BEARING GREATLY REDUCE THE EFFORT WHEN DEPLOYING OUTRIGGERS TO A MINIMUM. LIGHTING PROTECTION PACKAGES AT MULTIPLE LEVELS RUNNING LED WITH A 7KW GENERATOR VS 40KW. BACK- UP SAFETY LOCK-OUTS AVAILABLE FOR ALL SECTIONS IF TOWERS GOING TO BE CLIMBED. X,Y,Z MICROWAVE DISH PAN AND TILT REMOTE CONTROL, ALL SIZE DISHES PLACEMENT AND CONTROLS AVAILABLE. LMS60 60′ 100% TOTAL SOLAR CONFIGURATIONS, MANY OPTION INTEGRATION SYSTEM. ONE STOP SHOP. LMS DOUBLE CABLE REEL WITH HANDLES GALVANIZED WITH INNER STEEL INNER STEEL LINING AND FLIP HANDLE FOR MULTIPLE CABLE CABLE STORAGE. DOUBLE WALL CONTAINMENT FUEL TANKS 50 GALLON / 100 GALLON. 30′ REMOTE CONTROL TOWER LIFT KITS. 6′ OUTRIGGER JACKS FOR SLOPE DEPLOYMENT. MICROWAVE DISH STAR BRACKET MOUNT AND TORSION ASSEMBLY ATTACHMENT WITH EXTRA GUY SET OF THREE FOR FRACTIONAL MOVEMENT AND STABILITY. SLIDE OUTS FOR CABINET SERVICE. CUSTOM SIZE PER REQUEST. NEEDLE BEARING OUTRIGGERS ALLOW TWO FINGER OPERATION WITH EASE. 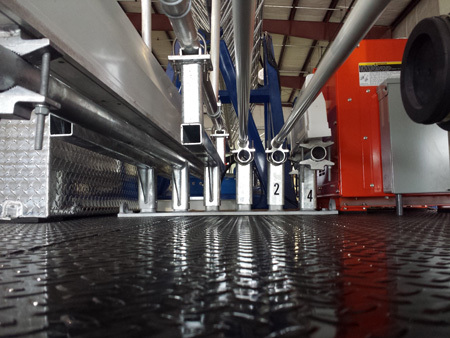 PLATFORM SAFETY RAIL SYSTEMS. WORKING AREA OF DECK WITH FULL WALK AROUND FOR SAFETY AND EQUIPMENT ATTACHMENT. TRAINING TOWERS FOR CLIMBER TRAINING SCHOOLS TEACHING CLIMBER RESCUE AND SAFETY WITH OUR SYSTEMS. 50HZ POWER CONFIGURATION FOR EUROPE, ASIA AND AFRICA. LIGHTNING ROD SYSTEM FOR TOWER TOP MOUNT. POWER CONFIGURATION WORLD WIDE 240 VOLT, 50HZ, AND FUEL, POWER REQUIREMENTS WE DO IT. TOWER OUTRIGGER JACK SHOE OPTION FOR SOLID PLACEMENT. FULL TRAILER PRIMED WITH INORGANIC ZINC CONFORMING TO MDDOD-P-23236A. COATED WITH AN EPOXY POLY-AMIDE INTERMEDIATE COAT CONFORMING TO MS-P-2441 FORMULA 150 AND URETHANE TOP COAT CONFORMING TO RAIL SYSTEM. PATENT PENDING LMS PORTABLE ANTENNA TOWER STOPS. FOR REDUNDANT SECURITY WITH EXTREME HEAVY LOADS, OR ON A PERMANENT INSTALL. CABINETS WE INSTALL OR SHIP DIRECT. TILT HINGED BASES FOR LMS LATTICE TOWERS ALLOWING EASY GROUND INSTALL FOR TOWERS UP TO 150′. LMS TOWERS ARE THE HEAVIEST DUTY ANTENNA TOWER BUILT IN THE AMERICAS. EMP PROOF-NO POWER NO PROBLEM, WHETHER YOUR IN THE DESERT, OUTBACK, THEFT OF MOTOR. A CORDLESS DRILL OR IMPACT DRIVER CAN RETRACT THE TOWER AND THE SECONDARY KEY ATTACHMENT OPERATES THE FOR SAME FOR TILTING THE UNIT DOWN INTO TRANSPORTABLE POSITION. WINCH MOTORS AND ASSEMBLY, BEST TO KEEP COVERED WHEN NOT IN USE. WATER RESISTANT MOTOR AND HOUSING. ARCTIC LUBE AND SEALS FOR -50F; INCLUDES SEAL CHANGE AND FILL IN LOW TEMP REDUCERS. OUR MOTORS DO NOT NEED HEATERS, THEY WORK AT -100 BELOW.